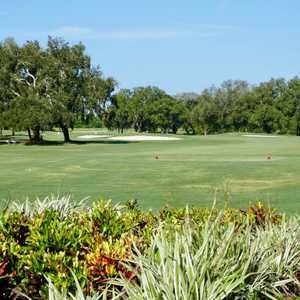 VENICE, Fla. - It's hard not to like the Venetian Golf and River Club right off the bat. If you're the kind of macho man who thinks he doesn't need to warm up, check your machismo at the bag drop and check out the course's practice range. It's a lake. That's right, a lake. You hit your practice balls into a big, fat lake. They have tiny, floating greens at various yardages, complete with the flag. No penalty strokes and no doubt about where your ball lands. There's something hugely satisfying about smashing it into the water instead of doing everything you can to avoid it. It's like laughing at your worst fears. There's something even more satisfying when - if - you actually hit the rock-hard green, sending your ball ricocheting off into the watery depths. Who cares if they spend a fortune on ball retrieval? It's worth it. So now that they've established some originality, you tee off looking for more. You don't exactly get something original, just inspirational, at least to Chip Powell. Powell designed Venetian and he has said he designed each hole with one of his architect role models in mind. I didn't know Salvador Dali was a golf architect. Some of Powell's green complexes are a bit, shall we say outlandish? No. 9, for example, would make Pinehurst No. 2 look flat and dull. The front half of the green slopes back to the fairway like a ski run. With the flag placed just a few feet over the top of the slope, putts come rolling back down to you if you don't give it enough juice. Or No. 11. The green is concave, dropping off into nothingness smack in the middle. It's like someone built an irrigation ditch through the middle of the green and forgot to fill it back up. "I think the architect got a little too cute," said mid-handicapper Jack Haley. Maybe. It depends on your perspective. I happen to like a little radical in my designs, though it's easy to see those who take the game a little too seriously may not be so discerning. What is indubitably true is that this is a course that's easy to drive, tough to score. Most of the greens, though not as radical as the previous two, fall off in one, two, three or even four directions, to grass bunkers or other more dastardly hazards. "We consider ourselves a links-style course," said Assistant Professional Ray Hafner. "Some of these greens, you have to hit to the right target. The game begins here at the greens, it doesn't matter how far you hit the ball. If you have a good short game, this is a great course to play." It's a great course to play even if you don't have a great short game. First of all, it's in immaculate condition. There are few trees, only a smattering of palm and pine stands, and the wind whips through unabated. Wild grasses are scattered throughout. Like the great architects from whom he draws inspiration, Powell has designed a course that rewards the bold, with most of the shortest routes to the green either over or close to obstacles, either large fairway bunkers of water. But, he still leaves room for the player who wants to play it safe. There are some shorter, driveable par-4s that can whup up on you if you're not careful, like No. 15, a 331-yarder with an elevated green behind high-lipped bunkers. No. 16 goads you to carry the marsh from 240 yards - do it and you'll have a short chip onto the green. The course is full of holes like this, risk-reward situations that make you stop and think, or just stop. 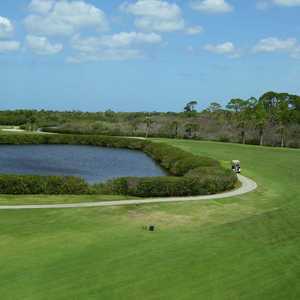 The course is outside of Venice in a nice, fairly isolated area, though it winds through a residential area with identical, Mediterranean-style homes along most holes. 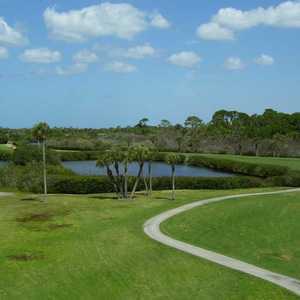 Being a Florida golf course, it also has more than its share of on-going construction, but even so, this is a course I would highly recommend. The Longboat Key Club sits so close to the Gulf of Mexico you can hear the grouper groaning and literally see the wind blowing patterns over the saltwater. If you fell off the balcony, you'd land on the beach almost. The sun sets in your picture window like a painting. It's an exclusive resort in an exclusive setting - Longboat Key is home to many rich and famous, and known for its literary lights: John D. MacDonald used to live here. Water sports are the big deal here, with boating and fishing excursions available, or if you don't want to go that far, the resort has sailboats, kayaks boogie boards and snorkel equipment. If that's still too much activity, umbrellas and cabanas are available, or just lounge by the pool or sit at the outside bar and stare at the Gulf. Longboat Key Club has no less than six restaurants and lounges, starting with Sands Pointe, with the broad sweep of the Gulf as a backdrop. The Grill at Harborside serves seafood and steaks for dinner and the Dining Room at Harborside offers a buffet. Barefoots is the poolside lounge where you get the pink drinks with umbrellas, and Spike n' Tees overlooks the golf course. If you want to make the short drive in to Sarasota, there is a wide variety of restaurants. The course opened in May 2003, is just under 7,000 yards and has a slope rating of 127 from the back tees.